You are a gravedigger in a small town. Business is very good, but your job doesn’t pay much, is very dirty and above all, IS REALLY BORING! To add some excitement and an extra source of income to your life, you decide to start a contest with your fellow gravediggers. Everyone has one week to borrow as many valuables from their clients as they can. Any cemetery is fair game and whomever has the most stuff at the end wins. Everyone agrees it sounds like fun and let’s face it, they can’t take it with them! 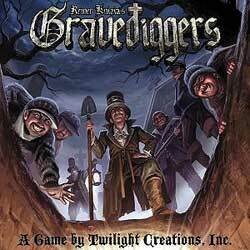 Gravediggers is an easy bidding game from the award-winning designer, Dr. Reiner Knizia.